This element of discontinuity consists of unexpected intercuts that assault the viewer with images of poor down-and-outs, homeless people and beggars. The unfiltered parallel world of marginalization is revealed through the raw, aggressive noise of the city. Instead, the uninterrupted walking of the key figure through the crowd is accompanied by a particularly alienating soundtrack, taken from ‘Vibractions’, a sound installation by the artist dating from 1978. We never see the face of the barefoot man. 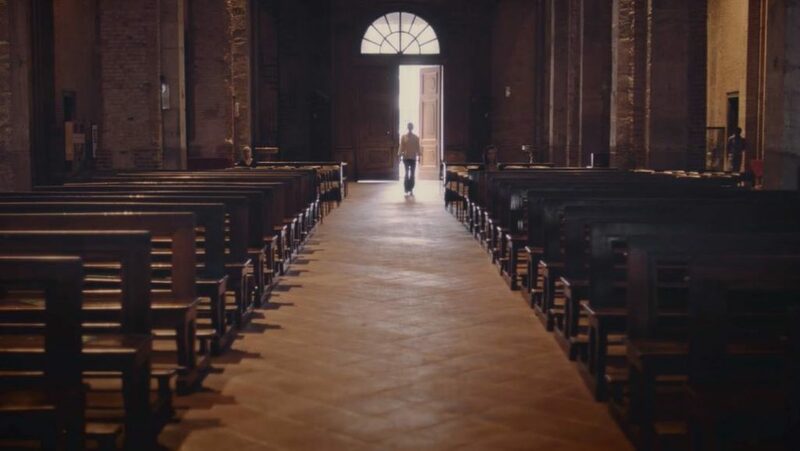 During his wanderings, he enters three churches, and the noise of the world goes in with him. Each time a churchgoer is disturbed during their silent contemplation, and they shush him. Forced to leave, he returns to the outside world, the noise following him like a burden he carries. The last scene shows him walking away, disappearing into the sky. His identity is never revealed. The whole framework of the video develops as an investigation of an unknown person whose wanderings – in a crowded Milan, full of people shopping, everyone with their mobile phones ready to snap a photo or a selfie – are a disruptive element. The ‘request for sense’ that Rumore puts forward is urgent, forcing the viewer to reflect. The intercuts of the marginalized world disturb our daily lives, casting a crude light on a reality that cannot be ignored.